The Getty Center is a must-see attraction in LA. It’s an oasis of calm which sits high up on a hill with stunning views of Bel Air and downtown Los Angeles. It’s basically an art gallery and café and along with the Getty Villa in Malibu, the two sites form the Getty Museum. The modern art is impressive and there are several galleries in several buildings to see packed with European paintings, sculpture, manuscripts, decorative arts, and photographs. However, for us, the architecture and atmosphere of the Getty Centre are just as important to experience. The buildings are almost futuristic in design with angular corners in stone and glass. The other great thing is the gardens that surround the center – they’re absolutely beautiful and are packed with colour from flowers, evergreen hedges and water features. Best of all, it’s free! We spent several hours here as it’s such a relaxing and calming place. So much so, that we’d say this is one of our favourite places in LA. You can’t beat striking architecture, beautiful gardens, impressive works of art and a sense of peace. We also enjoy the irony of being in a calm and peaceful place whilst overlooking the bustling and congested 405 highway! When arriving at the Getty Centre, there is a multi-storey parking lot at the bottom of the hill in the parking lot and you then take the regular free tram to the top. The center is quite large and you’ll need a couple of hours at least to wander around – more if you plan to eat. The Getty Center is open Sunday & Tuesday to Friday between 10am and 5.30pm, Saturday from 10am to 9pm. Closed on Mondays. It’s signed from the Interstate 405 with the main gate. 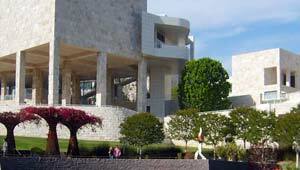 You can take an organised trip to the Getty Center with a pickup from your hotel here. Address: The Getty Center, 1200 Getty Center Drive, Los Angeles, California 90049. Access to the Getty Center is only available via the main gate on Sepulveda Boulevard.